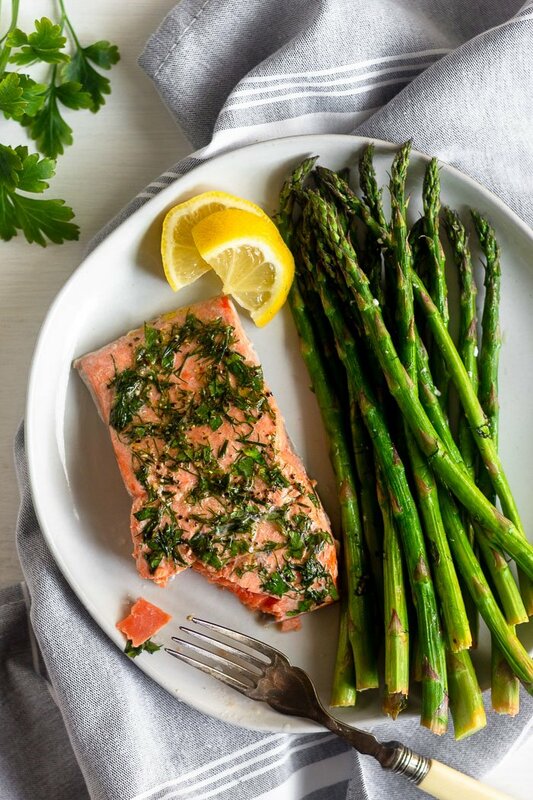 Air fryer salmon & asparagus is made in one pan and only calls for 6 ingredients. Packed with protein, healthy fats, and veggies, it makes a quick (15 minutes!) 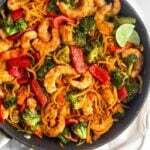 and easy low carb, paleo, Whole30, and keto friendly meal. You guys should know how much I love my air fryer by now. If these boneless buffalo wings haven’t sold you yet, then this air fryer salmon & asparagus will. If you want a simple, healthy, and quick dinner, this is the meal for you. We are all about the easy dinners at the moment – if you missed it, it’s 30 minute meal solutions month! Aka all recipe are made in one pan and take 30 minutes or less! We started off with a chicken sausage soup, went the vegetarian route and made eggplant parmesan (in the Instant Pot! ), and even made 30 minute one pot chicken curry! It’s officially spring and I am craving all the lighter foods. Fresh seafoods, filling salads, and lots of fresh and colorful produce. 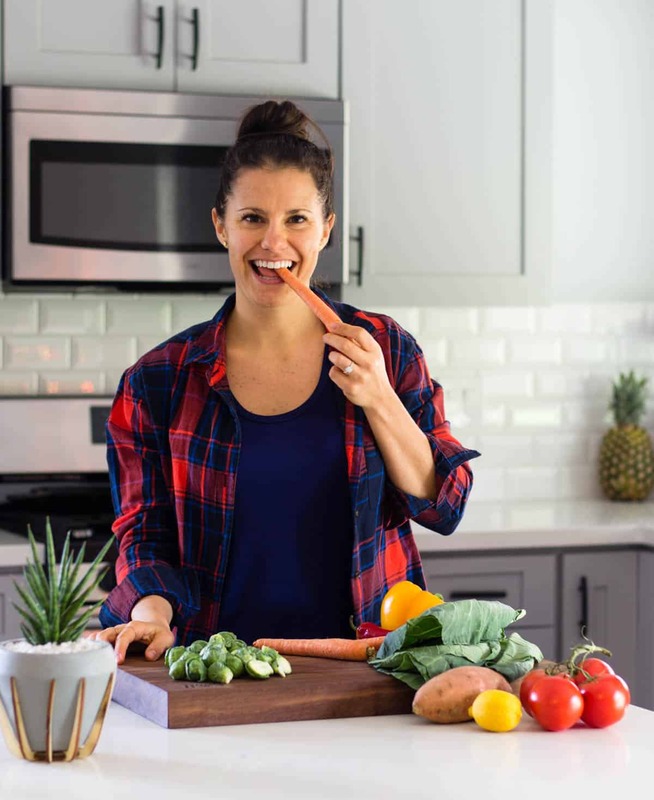 As much as I love fall produce (squashes, beets, sweet potatoes, and all those root veggies), there is just something about the warm air and sunshine that makes me feel alive. This salmon recipe hits on all of that. With the nice weather around the corner (or practically here if you live in Austin like me), there is no time to be wasting in the kitchen. Time to get outside, enjoy the sun on your face, and get out of the kitchen (for the most part). 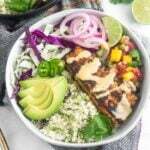 Loaded with protein, healthy fats, and some veggies, you only need 6 ingredients to whip together this simple salmon recipe. 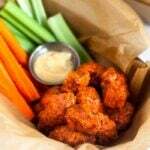 Just 5 minutes of prep time and 8 minutes of cook time and everything is cooked in one pan/basket in your air fryer. Which means minimal clean up and dishes to do. Winning on all parts in my opinion! 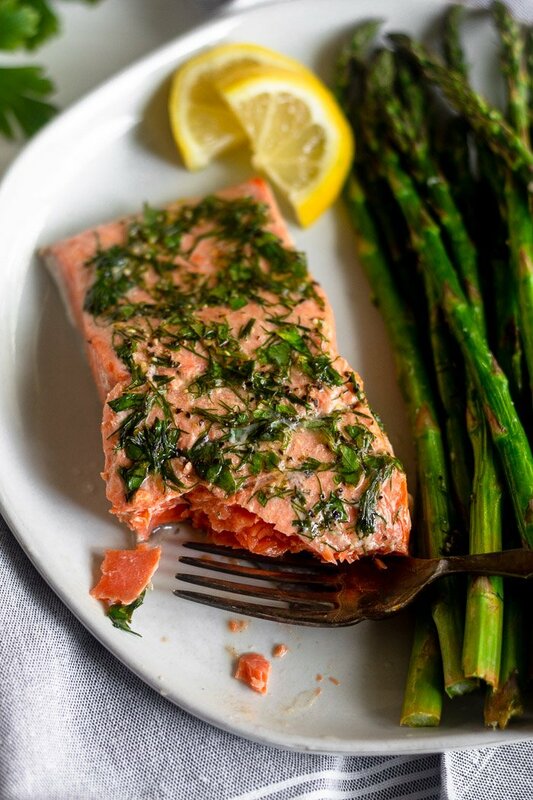 First you start by making the dill and parsley mixture that will coat the salmon and asparagus. 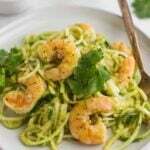 In a small bowl, add the dill, parsley, lemon juice, oil, and salt and pepper and whisk to combine. Coat the flesh of the salmon with about 3/4 of the mixture. Next, take the remaining mixture and toss it with the asparagus in a medium bowl. Then you just fill your air fryer with the asparagus, spreading it out evenly on the bottom. 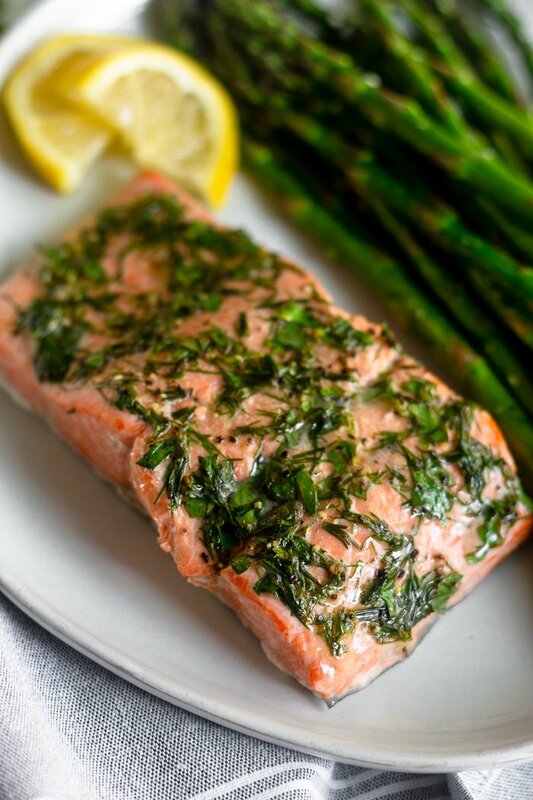 Place the salmon on top and cook for 6-8 minutes depending on how thick your salmon filets are and your preference of how you like your fish. It is really that easy! This meal is pretty low calorie, so I would suggest bulking it up some with some healthy fats and carbs. It would be great served with rice, quinoa, pasta, whole roasted sweet potatoes, or oven roasted crispy potatoes. 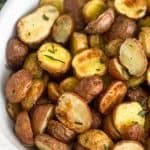 You could totally make these air fryer potatoes first, and then add your salmon & asparagus to the basket after they are done for the ultimate one pan meal. To add some more fat, serve with some avocado, top with some mayo or creamy lemon garlic sauce, or you could totally drizzle some tahini on it. Tahini and salmon is so so good! To keep it low carb, add some more green veggies on the side. I know not everyone has an air fryer. I was hesitant at first about them too and didn’t really know if I would like it. Well I quickly made up my mind and I love it, but I do understand it is another appliance to add to your kitchen. 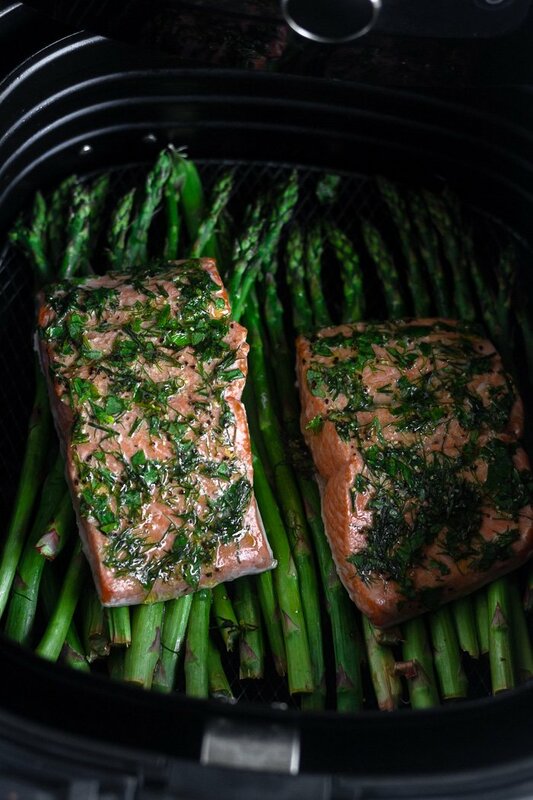 If you don’t have an air fryer, you can easily make this salmon & asparagus in the oven. Preheat the oven to 400 degrees and line a baking sheet with parchment paper. 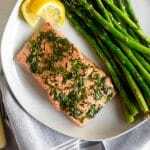 Follow the directions for coating the salmon and asparagus with the dill mixture. 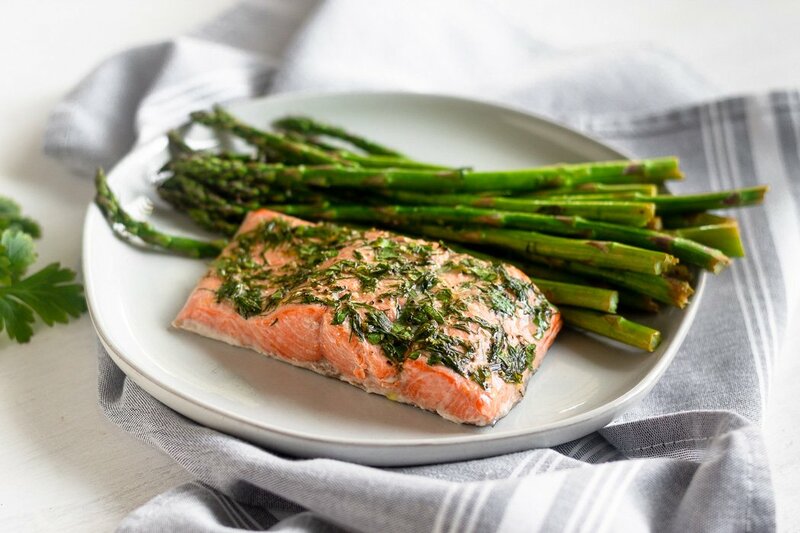 Spread out salmon and asparagus on the baking sheet and bake for 8-15 minutes depending on thickness and preference of how you liked your fish and veggies cooked. This recipe saves great for meal prep for a quick and easy lunch at work during the week. If you don’t want your salmon to dry out when you reheat it, I would suggest under cooking it by a little. Just by a minute or two of how you like to eat it and then when heat it up, it will cook to your preference. Make sure to check out the video at the top of the page to see how easy this recipe comes together! 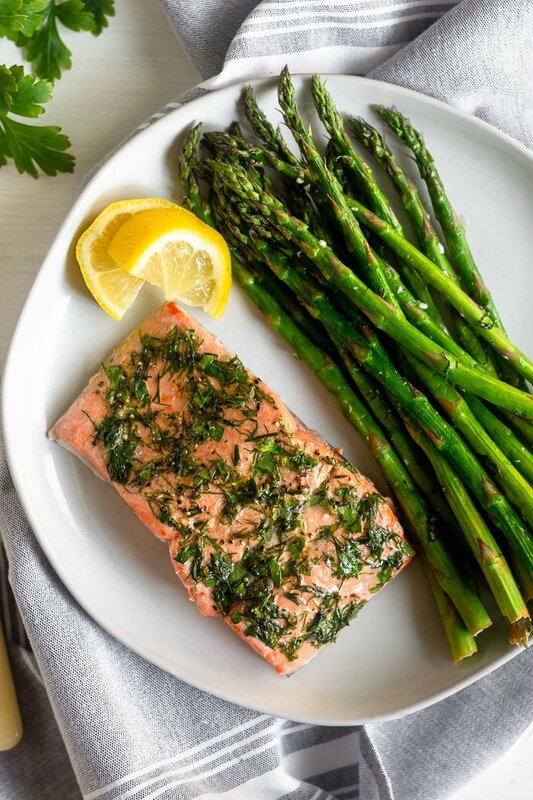 Air fryer salmon & asparagus in made in one pan and only call for 6 ingredients. Packed with protein, healthy fats, and veggies, it makes a quick (15 minutes!) 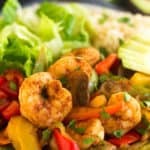 and easy low carb, paleo, Whole30, and keto friendly meal. In a small bowl, mix the lemon juice, olive oil, dill, parsley, and salt and pepper. 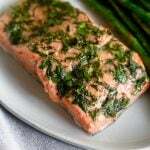 With a spoon, coat the leash of salmon with ¾ of the dill and parsley mixture. In a medium bowl, add the asparagus and the rest of the mixture and mix well to combine. Add asparagus to the air fryer basket, spreading out evenly across the bottom. 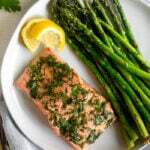 Place salmon filets on top, resting on the asparagus. Close drawer and set to fish (400 degrees) for 6-8 minutes, depending on how thick your salmon is and your desired preference for fish. Top with some more lemon juice to serve and enjoy!